Knowledge is power and in the case of Facebook’s EdgeRank secret sauce, having an understanding of its ins and outs is crucial to success. This is a measurement of the relationship between viewer and creator of the story. If for instance the user and creator have a close relationship then it will score higher in the EdgeRank. So, if your brother posts it will be more likely to appear on your feed over some guy he befriended on holiday two years ago. Frequent interaction also raises the affinity score, though this only works one way. For example, those who interact will be more likely to see the status of the person they interact with. This will not work the other way around. So, if you interact with a person and they don’t in return they will not be any more likely to see your status on their Newsfeed. As we’re more than well aware, different sorts of media and statuses have different weight in the EdgeRank. Though we can’t be 100 per cent sure, it seems that it is ranked like this. This is done to encourage usage and posting specific posts over others will see your status carry more weight. However, engagement from other users also is factored into play here. So, a text status update with lots of Likes and engagement will carry more weight than a photo with no Likes or engagement. The older and less fresh a status is, the less value it has. The complex thing here is that the freshness depends on the amount of time an individual logs in. So, if you only log in once a week you may still have the most important news for you on your time line from 6 days ago. If you log in each day and otherwise have the exact same Facebook credentials, friends etc; then this status could be gone 5 days previously. 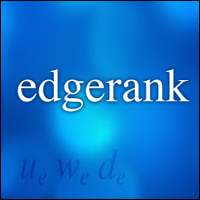 You need to master EdgeRank – simple as! According to statistics 96 % of fans won’t return to a Brand’s Facebook page after the initial engagement, meaning you are between 40x to 160x more likely to reach fans via EdgeRank than through your page. Over a quarter of all time spent on Facebook by people is on the Newsfeed. Putting that in perspective; in the USA people are said to spend more time on the Newsfeed than they do on ABC, MSN , Yahoo, CNN and the Huffington Post combined. Even with the change in EdgeRank and the reduced amount of exposure for many brands, you can still see that the exposure is potentially huge. It’s larger still if you can hone your posts for maximum exposure. So, how do you hone posts? – Short posts of between 100 – 250 characters do 60% in engagement terms than longer posts. – Relevance – not directly about your brand, but related to topics of interest. – Time – Use online tools such as Crowdbooster and PageLever Now to find out the best times for posting. We’ve posted a number of blogs on timing of posts, the best types of posts and also EdgeRank changes and how to cater for them. Remember, as we said initially – information is power – so use it. Can’t get your head around EdgeRank? Hire us for social media marketing.